We have taken the Speedster to the next level. 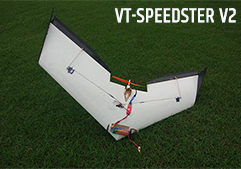 By adding a blunt edge, to our VT-Speedster, the VT-Speedster PRO now offers superior FPV performance and endurance. Can easily take 2x 2200mAh 3S Lipo and can give 20-30 minute endurance. Low wing loading enables easy launches and landings yet offering a fun-filled zippy flying experience.